As we approach the spring season, you may notice our Chilean Flamingos becoming more active than usual. Chilean Flamingo courtship happens long before they even begin to build their nests in the summer time. Around January and February, our flock at the Houston Zoo can be seen head flagging, which is one of the first breeding behaviors they start to display. The flamingos will elongate their necks as much as possible and move their heads side to side, looking a lot like flags blowing in the wind. In March and April, the flock will begin to do wing displays. Some can be seen standing tall and sticking their wings straight out to their sides. Others can be seen leaning forward, like a bow, and flipping their wings straight up to the sky. Some even do a wing display including one of their legs. They will stretch their leg back and to the side while simultaneously stretching their wing on the same side. Once it gets closer to May, our flock can be seen marching around the island in their exhibit. This is by far my favorite behavior they do, because the whole flock will do it together. This is the indication that the flock is ready to start breeding and they will soon start to pair off. The females will choose the male that has the most impressive dance moves. Once paired off, you can spot the males closely following their female mate wherever they go. I know a lot of this may be hard to picture, so here is a video from National Geographic of a flamingo flock marching. Some of our Conservation Education team have also performed an interpretive dance depicting flamingo breeding behaviors. Enjoy. 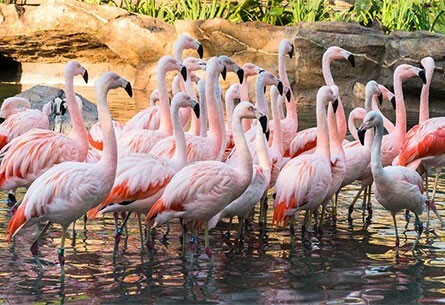 Take some time on your next visit to the zoo to observe our Chilean Flamingo flock and see if you can spot any of these unique behaviors. Or the best gift of all: create your own jazzy flamingo dance. Who doesn’t love a good dance partner?! Thanks for reading and I hope that you will join us and National Geographic in the celebration of the year of the bird!